A central attraction on Liebherr’s bC India stand is the company’s 85 EC-B 5i flat-top tower crane. The model is manufactured at the company’s factory in Pune, India and has been designed for the specific needs of the local market. The model is only available in India. The unit has a maximum capacity of 5 tonnes and can lift 1.3 tonnes at the end of a 50 m maximum length jib. However, it sits on a footprint of just 1.2 x 1.2 m, and the company says this combination of high capacity on a small cross-section makes it ideal for the confined construction sites often found in Indian cities. The 85 EC-B 5i has been manufactured in Pune since 2012, and Liebherr said it was developing a second crane at the factory for the Indian market, based on the success of this first model. 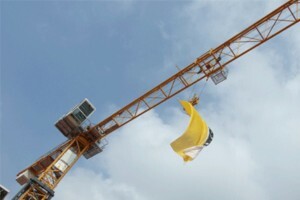 At present, a number of 85 EC-B 5i Flat-Top cranes are at work in India, and the company said key locations included Pune, Delhi, Mangalore and Mumbai, where the ability to climb upwards inside as well as outside under-construction buildings was an advantage. In Noida, an 85 EC-B 5i is currently in use as internal climbing crane on the “Amadeus” project where a building with 36 floors is due for completion by the end of 2016. In the final stage of the project, the 85 EC-B 5i will reach a hook height of more than 130 m.
Another project is Panchshil Towers in Wagholi, Pune. This residential building project covers an area of 17 acres. The 85 EC-B 5i is used as internal climbing crane for works at the highest building and will reach its maximum hook height of some 110 m.